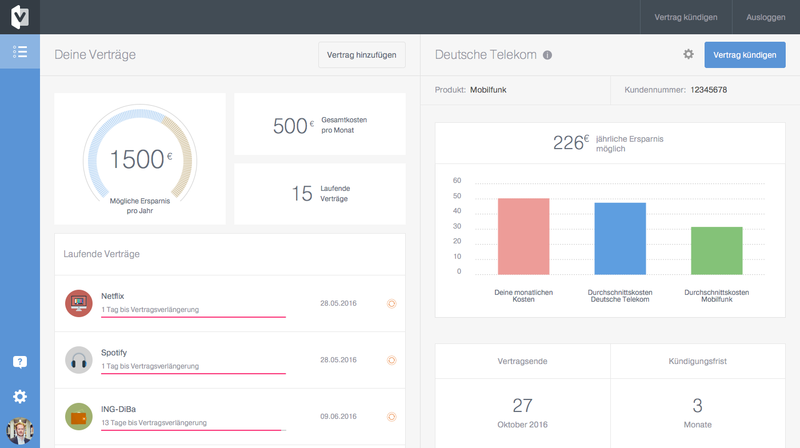 volders, a Berlin-based contract management startup raised two million euros. The company describes itself as a personal contract assistant. You feed the application with your contracts and it manages them for you. You are alerted about contract expiration, you can cancel or prolong contracts and in combination with a built-in price comparison tool you can compare and sign up for new contracts. With their latest investment they want to position themselves as your „personal digital contract assistant“. Furthermore, they want to make “their customer service more proactive and tailor the comparison and prolongation offers more towards their customers“. This year they increased their user base by 50 percent to 550.000 (from Gründerszene). Their plan (more proactive customer service and more tailored comparison and prolongation offers) — however vague it sounds — points at some of the issues they face. Contract management is trigger-based (you switch your contract only through a trigger in your life) and the diminishing value of contract optimization (you can cancel or get a better offer only a limited amount of times). Besides that, volders is in a difficult business because there is a limited amount of contracts (certain contracts you would never cancel), people have little motivation due to delayed rewards and uncertainty, customers’ avoidance of dealing with contracts and though competition. Contract cancellation is mostly based on a trigger. This trigger is always some sort of dissatisfaction with your contract (you do not need it anymore, you need a contract that covers more or you want a cheaper contract). volders’ founder Jan Hendrik Ansink once also confirmed that this trigger-based contract optimization also applies to volders. 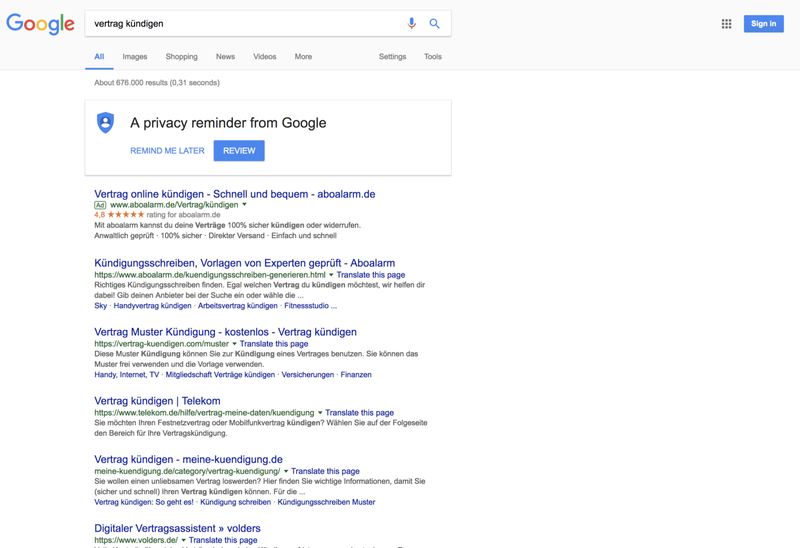 Furthermore, you can see that Aboalarm, an indirect competitor, is aware of that; when you do a Google-search for „Vertrag kündigen“ (German for cancel contract); Aboalarm is the first search result. In such trigger-based contract optimization, you are more likely to end up with a dedicated tool than firstlly including your account in a contract management application and then canceling your contract. However, as you can cancel your contracts with volders without adding your contract to the app, my argument is not so valid in this example. However, it is valid in one of volders’ other services, namely comparing and switching contracts. With volders you can only compare and switch after adding your contracts to the app. Not only does this lower the amount of people they can reach, dedicated comparison tools can offer better comparisons. However, once volders gets you onto their site, they have to deal with unmotivated people and people’s avoidance of dealing with contracts. A preventive innovation is „a new idea that an individual adopts now in order to lower the probability of some unwanted future even“ . It is characterized by uncertainty and delayed reward. Due to these two characteristics people have troubles assessing an innovation’s relative advantage. Both characteristics are available with volders which make it an innovation difficult to diffuse. With volders uncertainty comes from not knowing whether you can safe money through contract comparison. And the reward from in time cancellation is a delayed reward because not forgetting to cancel a contract lies in the future. Furthermore, contracts are a topic people have always avoided dealing with. Realizing furthermore that they spend too little time with contract optimization will upset them and derail them even more from using it. Think of doing your taxes as a comparison. There are several contracts you would not cancel due to the contract’s unique offering (think Netflix or Spotify). The amount of contracts you can cancel decrease to zero at one point because you have canceled them already. Furthermore, the chance of receiving a better offer is lower each time. In essence, they are turning a one-time service (switching contracts) into a recurring activity which simply defies logic in my eyes. In this context I think that their plan (more proactive customer service and more tailored comparison and prolongation offers) is motivated by this very fact that customers use their service only very infrequently. In all this negative talk about volders, one must, of course, not forget that their separate offerings (notifications about contract expiration, cancellation of contracts and contractor comparison with contract switching) are very useful. However, competitors are aware of that and the landscape is not in their favor. BenchBox is only one competitor that offers that same one-step solution. Although BenchBox’ integration is not as good as volders’. However, for each of these use cases numerous separate competitors exist (see table). Forward integration through contract companies: The source for their value offering (intransparent cancellation process, prices, and contract conditions) is solved at the core; the companies that have these intransparent processes, prices, and contract conditions are making their offerings more user-friendly. Competition through specialized solutions: Competitors who offer specialized solutions of volders’ offerings (e. g. price comparison sites) provide a better service. Competition through companies with market pull: Competitors who offer specialized solutions of volders’ offerings have wider reach because of market pull. For instance, customers actively look for price comparison and end up with companies tailored to that use. 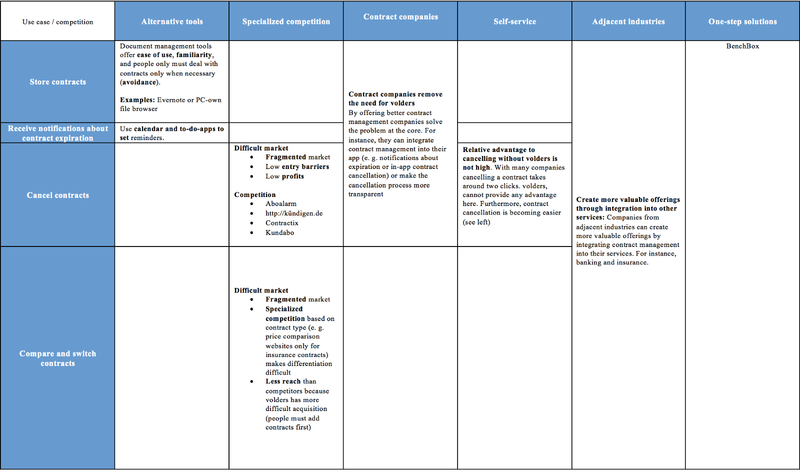 Competition through adjacent industries: Companies from adjacent industries can create more valuable offerings by integrating contract management into their services. Insurance and banking apps are two great examples. N26, for instance, is partnering with the digital insurance broker Clark to offer contract management in their banking app. Furthermore, banking apps could extend into contract detection based on financial outflows which would ease the whole process of collecting contacts in the first place. Furthermore, combining payment info with contracts is very powerful because bank apps could then suggest new contracts based on changing income. For instance, if somebody spends 1000€ on a new PC, the bank app could offer an insurance based on that. In this case it really makes sense to argue that no (direct) competition is a bad sign, namely the sign of a too small market. Nevertheless, it merits to finally look at why they received their first investment (they have not issued a press release for the second investment). They received their first investment (six-figure) in 2015 while they were still operating under the name of vertragslotse.com. Ingo Drexler, board of administration at one of the investors Mountain Partners, justified the investment by claiming that they believe in the value vertragslotse offers to consumers. He backed that up by the high amount of search requests on Google regarding contracts. Furthermore, he stated that a lot of long-term contracts are still analogous, and an overview of costs and deadlines is missing despite savings potential . Digitalization of contracts and transparency about deadlines makes a lot of sense, but as explained above there are too many competitors and alternative solutions to this issues. Furthermore, I also touched on the exploration of savings potential above; the diminishing returns, specialized competition and nature of preventive innovation are three reasons why I see this as a difficult justification.